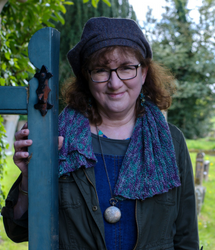 Sophie Sayers has been living in the Cotswold village of Wendlebury Barrow for six months and is beginning feel part of the village community. Every day she feels grateful that she decided to leave her dominating and selfish boyfriend, Damian, and live in the cottage left to her by her Great-Aunt May. Now Sophie has a job she loves in the village bookshop, Hector’s House, and a new boyfriend, Hector, the bookshop owner. Hector has encouraged Sophie’s dream of becoming a writer. Sophie has joined the Wendlebury Writing Group and, as her confidence has grown, she has initiated a joint venture between the local drama group and the school to produce a Nativity play. What is more, Sophie has written the play, with parts especially tailored to the various village personalities. Sophie has made many friends, including the warm-hearted, bubbly Carol, who owns and runs the village shop, and she is surprised to hear that Carol doesn’t not like Christmas, until Hector explains that a foolish and traumatic event when Carol was a teenager had destroyed her pleasure in celebrating Christmas. Despite her ebullience, Carol is a lonely woman who is desperate for somebody to love and cherish. Sophie is horrified when, returning from a night spent with Hector, she finds a white van parked outside her cottage. Her first hopes that this is a tradesman calling upon her elderly neighbour, Joshua, are swiftly dashed when she sees that the van has ‘Damian Drammaticus’ emblazoned on the side. Damian, her ex-boyfriend, has decided to reinsert himself into her life. Sophie has to fight hard to retain her newly-found confidence and not allow Damian to dominate her, especially when he announces that he is in Wendlebury to direct the Nativity Play. Even when he discovers that this is an unpaid position he decides to stay, and, when Sophie refuses to allow him to move into her cottage, he takes lodgings with Carol. Sophie is afraid that her relationship with Hector and her first attempt to write a play are both going to be endangered by Damian’s unwanted return to her life, but although she is very good at envisioning troubles that don’t exist, even in her wildest nightmares she had not imagined that the performance of the Nativity would be disrupted by a hysterical woman screaming that somebody had stolen her baby from the manger. 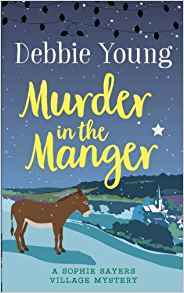 Murder in the Manger is the third book in the series featuring Sophie Sayers. It is the cosiest of cosy crime books, packed with eccentric and lovable characters and details of life in a country village. It is a delightful, easy to read book with plenty of gentle humour. A perfect Christmas read to relax with. Debbie Young was born and raised in Sidcup, Kent. When she was 14, her family relocated to Germany for her father’s job. Debbie spent four years at Frankfurt International School, broadening her outlook as well as gaining the then brand new IB (International Baccalaureate). 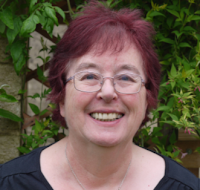 She returned to the UK to earn her BA (Hons) in English and Related Literature at the University of York, then lived and worked for a while in London and the West of England as a journalist and PR consultant. In 1991 she moved to the Cotswolds. In 2002, she married a Scot named Gordon whom she met in Swindon – and not, as village rumour once had it, a Swede named Scottie. In 2003, her daughter Laura was born. Best Murder in Show was the first in her series featuring Sophie Sayers. There are now a further three books in this series.